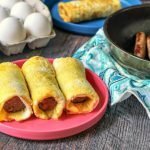 If you are looking for an easy grab & go low carb breakfast, try this sausage egg roll. Using the egg as the wrapper, you can make a bunch of these and freeze for a quick breakfast. Only 1.8g net carbs each. Cook the Italian sausage. When done, cut the sausage ends off and save for one of the wraps. Spray a nonstick small saute pan and a medium saute pan. Place each on the stove and heat to medium. Add the beaten egg to the smaller pan and swirl to fill the whole pan. When it is almost done cooking, flip into the medium pan and sprinkle cheese over top. Take off stove when cheese has melted. Continue with other egg to make 2 wraps. Fold the sides in a bit and place the larger piece of sausage on top. Roll up like an egg roll and set aside. Use the ends to make another egg roll. To freeze you can wrap with wax paper and place in a container or baggie and place in the freezer. To reheat microwave for 1 minute or until everything is warmed through.